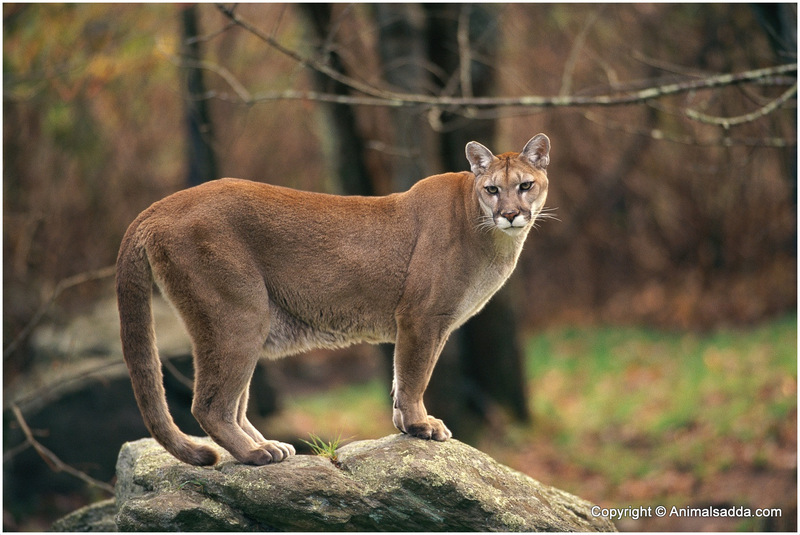 The cougar is a large feline species whose native home is the Americas. 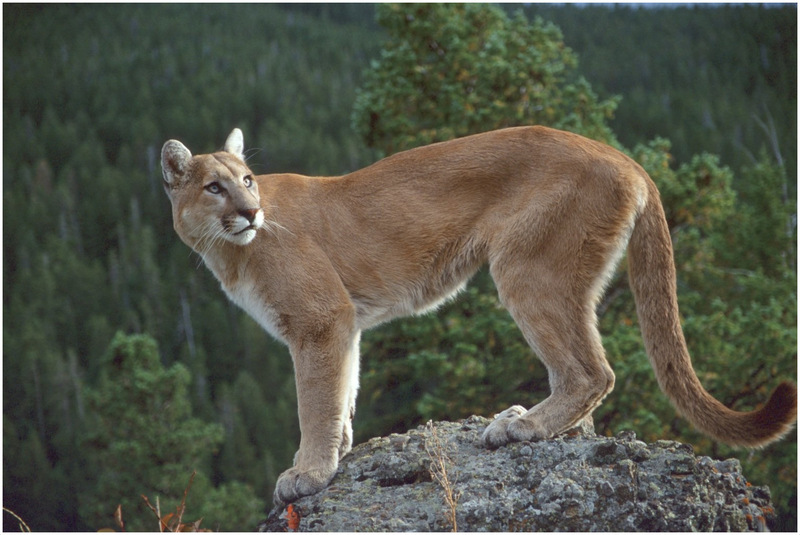 It’s also known as puma, mountain lion, catamount or panther. This wild cat largely resembles the domestic cat and also purrs like it instead of roaring like other big felines. It is the second largest cat in the Americas after the jaguar which is the largest. 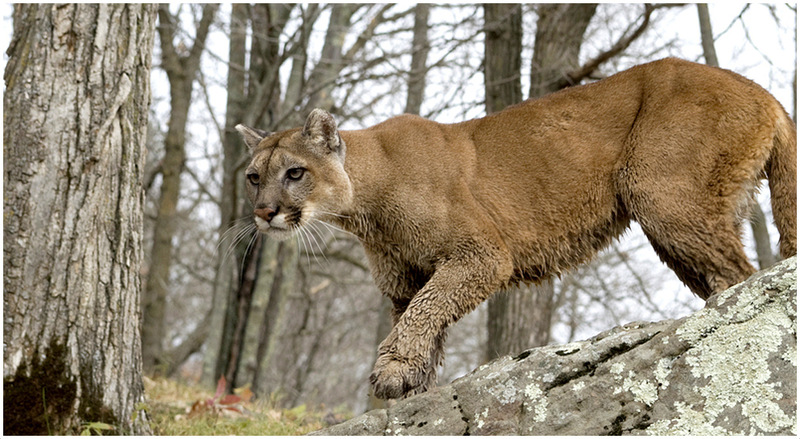 Cougars are the largest amongst small cats. It is from the sub-family Felinae, although it behaves much like big cats from the sub-family Felidae, like the cheetah. 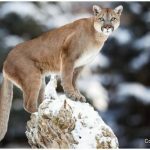 Originally, the cougar was considered to be of the genus Felis(Felis concolor), where the domestic cat also belongs. However it was re-classified in 1993 and placed in the genus Puma together with the jaguarundi. The closest relative of the cougar, apart from the jaguar, is the African cheetah. Although no family ties have been made between them yet. 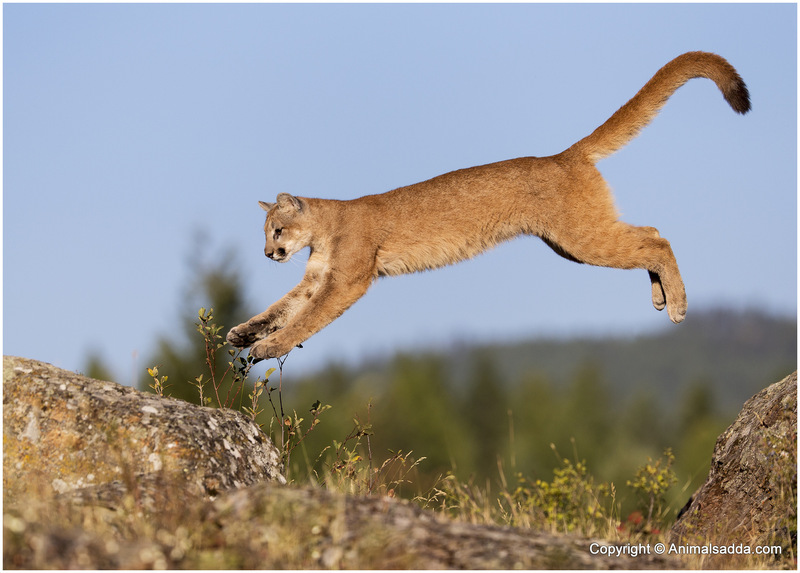 Young cougars prey on small rodents, hares, rabbits, coyotes, raccoons, and sometimes livestock and pets. 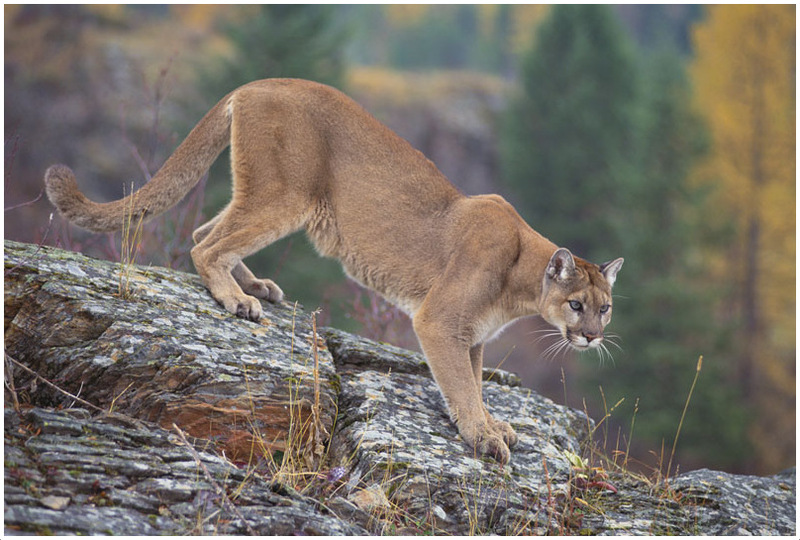 Adult male cougars, on the other hand, are seen to pry on elk and deer. 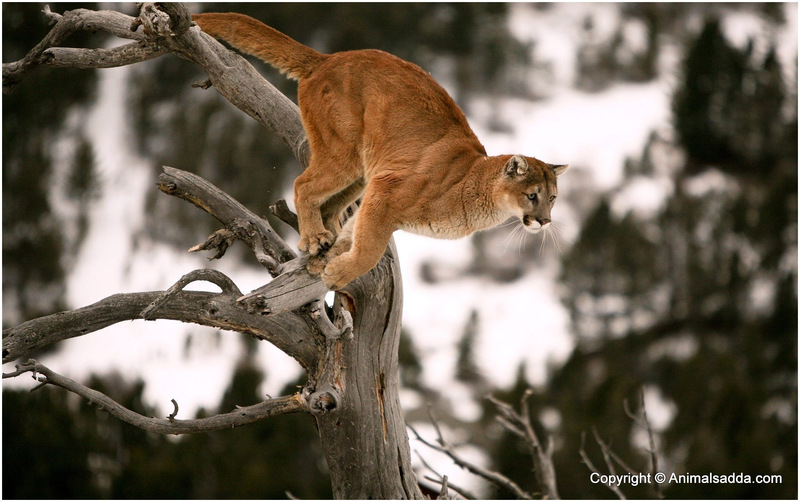 Cougars typically feed on a kill for several days and thus they hunt after every nine to twelve days. 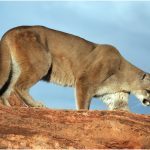 Cougars hunt and feed alone, except for female cougars with young ones that kill even daily or after every three days. 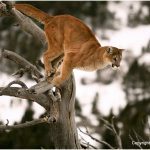 Cougars can adapt easily in most habitats and so they are found all over the Americas. They can live in open areas, although they generally prefer living in dense under-brushed areas, near rim rocks, on escarpments and in precipitous canyons from where they can stalk their prey. They occupy the largest territorial grounds amongst all the wild animals in the Americas. 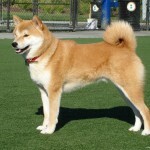 They can be found in mountainous deserts, lowlands, and all types of forests. Their habitat range is from latitude of 110 degrees in Canada’s northern Yukon to the Southern Andes. 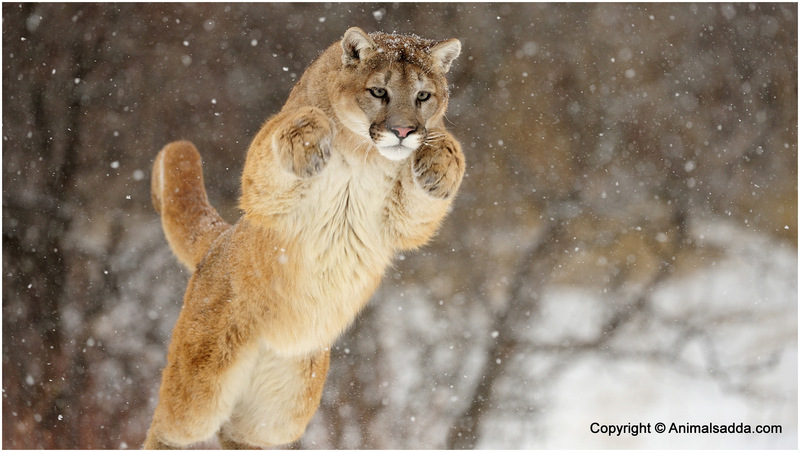 Cougars are generally shy, silent animals with very little voice communication. Their low pitched sound includes whistles, chirps, purrs and growls that can be compared to that of the house cat. They are famous for their screams which can be easily confused with the calls of humans or other animals. These solitary cats are also very territorial. They use their defecations, urine and scrape marks to attract mates and also to mark their territory. 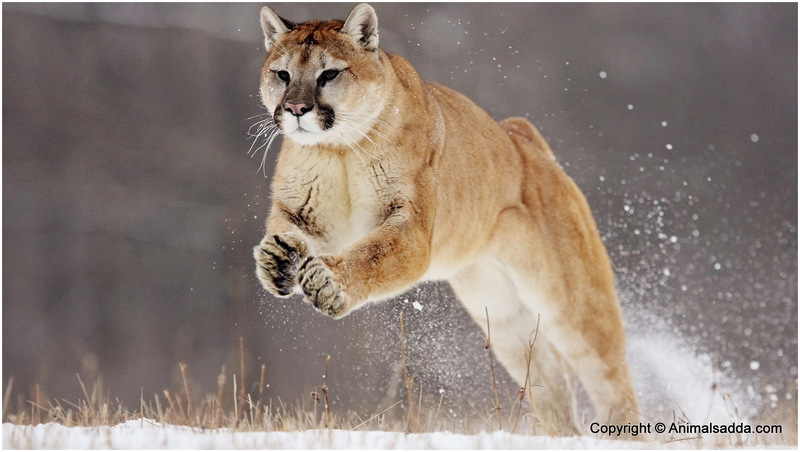 Cougars stay solitary for most part of their lives. Their only interaction happens during mating, and during the mother-kitten relationships. The kittens leave their mothers when they are two years old and go far away to establish their individual territories. Being shy, these cats only surface at dawn and during twilight in areas with human encroachment. Some of them also hunt at dusk when there is plenty of prey. 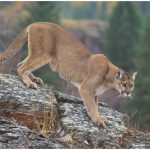 Cougar cubs are born blind and as a result are totally dependent on their fierce, protective mothers. At about three months of age, they start being weaned and begin to go hunting with their mothers. 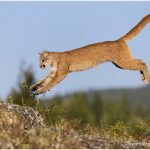 By the age of six months, they begin to hunt on their own and at about two years (sooner for males) they leave their mothers in an attempt to establish their own territory. Apart from humans, the only animal that has been seen to prey on cougars is the grizzly bear or the American black bear. 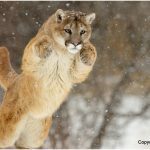 However, there is an active competition between cougars and the bears which in most times results in the cougars losing to the latter. The grey wolf is another animal that preys on cougars and steals their prey. Although the reverse also happens, and young and lone wolf females are often killed by cougars. Both species compete for the same preys and therefore they largely determine each other’s distribution. 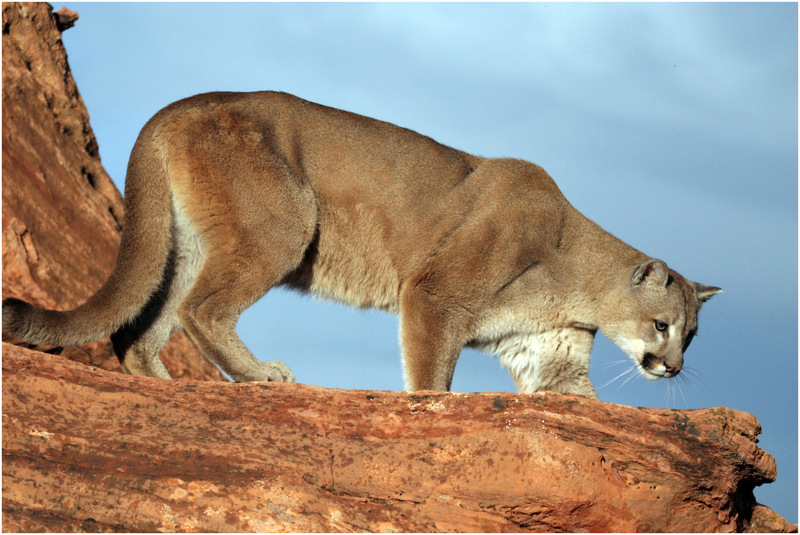 Cougars become sexually active at the age of 2 to 3 years. 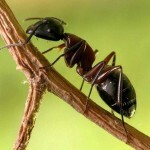 The females mate frequently and are often in estrus for an average of eight days in a 23-day cycle. They reproduce one litter, normally between one and six kittens once every two to three years, and in some cases every year. Females are the ones actively involved in parenting and are fierce, protective of their young ones. 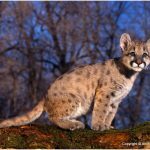 Cougar cubs are spotted, but they lose the spots with age and by two and a half years, they become completely plain. Variations in the plain color are seen in individuals even with the same parents. The color is usually tawny, but could be silvery-grey or reddish with the throat, chin, jaws and underbody spotting shades of lighter color. They are slender cats with adults being 24-35 inches (60-90cm) tall. Adult males averagely weigh 137lbs. (62kg) while most females are smaller, weighing only 93lbs. (42kg). 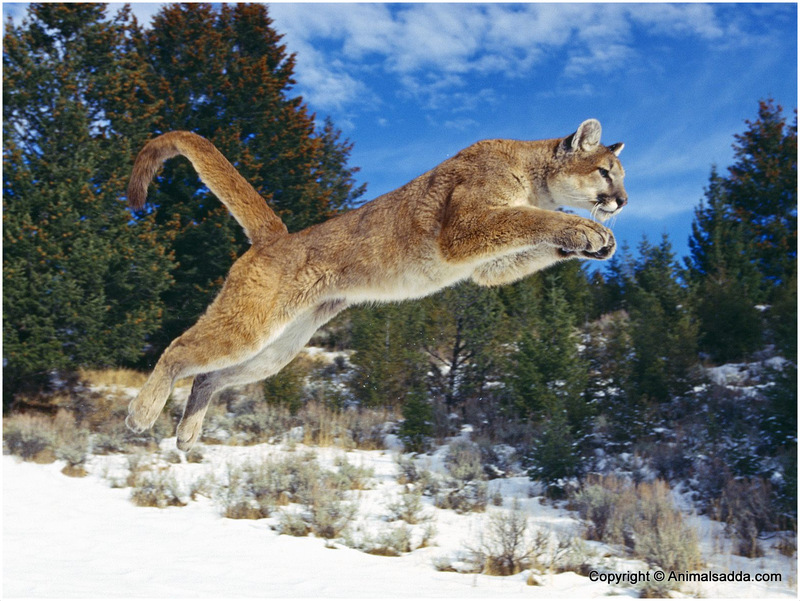 Cougars living near the equator are smaller compared to those near the poles. 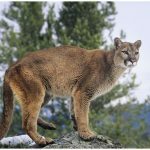 The cougar is characterized by a round head with straight ears. Their front feet are smaller with five hinged claws, while the hind legs are more powerful with four claws. They also spot a powerful jaw, neck, and forequarters – an adaptation for hunting. 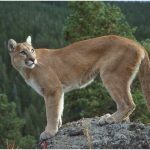 The life expectancy of cougars living in the wild is 10 years on average although a female cougar as old as 18 years has been found. 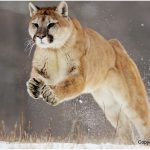 In captivity, these cats can live up to 20 years; with the oldest to date being a North American cougar that died just months away from becoming 30 years. 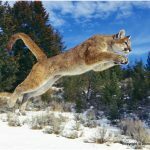 In the wild, they die as a result of competition with other cougars, human poachers, accidents, starvation, diseases and disabilities. 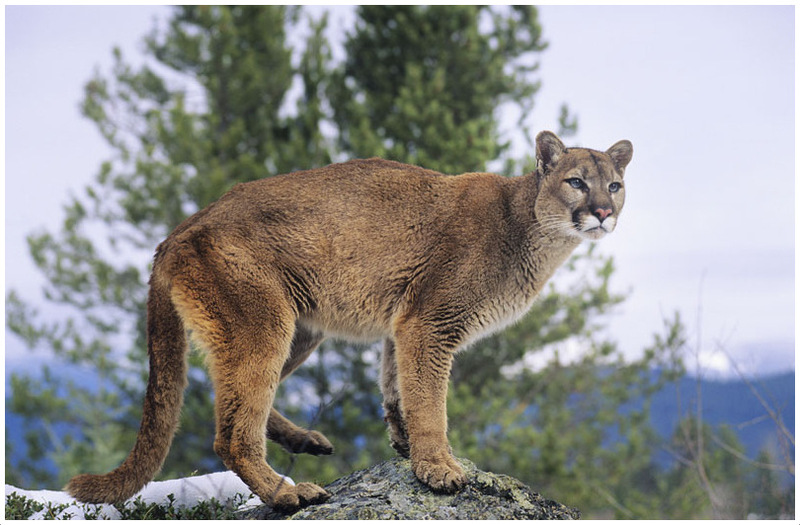 The cougar is susceptible to the Feline Immunodeficiency virus, an infectious HIV-like cat virus. However, few deaths have been associated to this disease in comparison to more natural deaths. 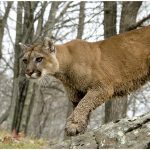 Cougars with Feline distemper (Feline panleukopenia) antibodies have also been recorded, although it is not known to what degree this causes cougar deaths, or if the disease is transferable to humans and other animals. 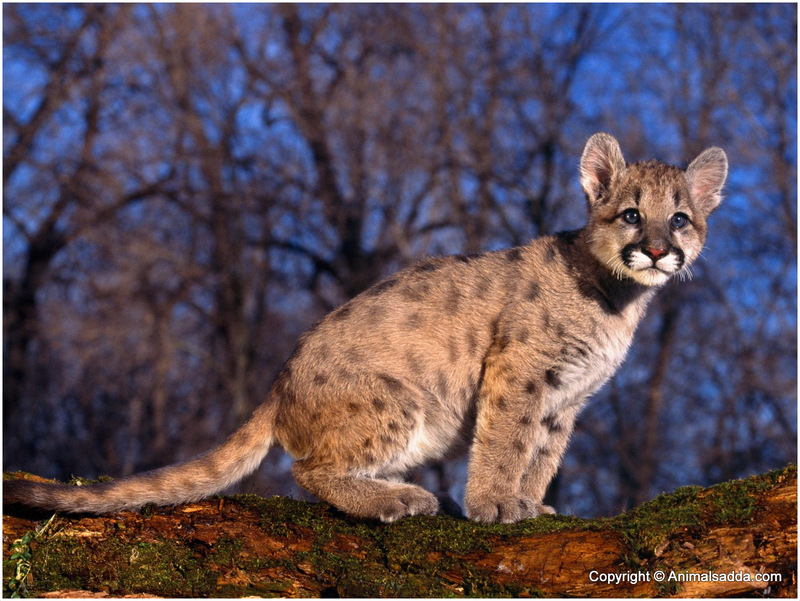 Cougar kittens are born with blue eyes and a ring on their tail. 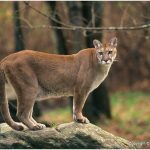 The cougar, according to the Guinness book of World record, has the most name variations, with more than 40 English names.